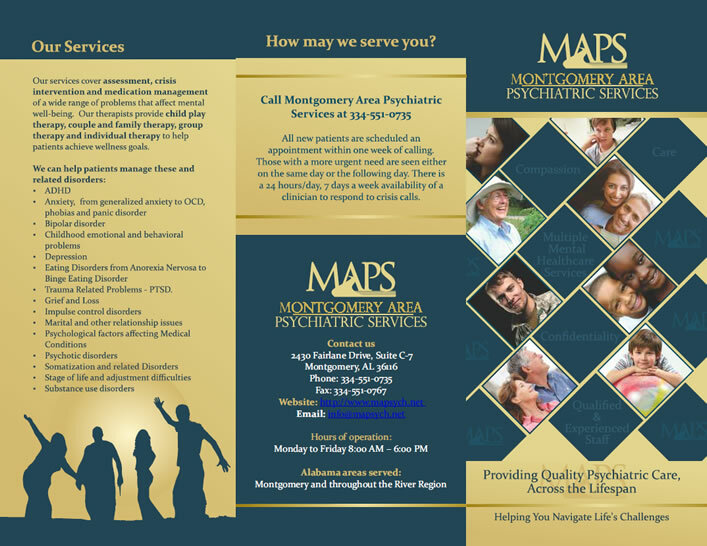 Montgomery Area Psychiatric Services (MAPs) is an outpatient mental health facility with a team of Psychiatrists, Clinical Social Worker, and Licensed Professional Counselors providing assessment, diagnosis and treatment of mental illness. Entheos designed a brochure for MAPS to be given to referrers such as medical Doctors, Internists, Family Doctors, Gynecologists as well as others in the allied mental health field – Therapists and Counsellors. 3. Understated text on blue diamonds, giving the advantages of the facility in each diamond: ‘Multiple Mental Healthcare Services’ ‘Qualified and Experienced Staff’. ‘Care.’ ‘Compassion.’ ‘Confidentiality’. This is repeated in the headline of the inner pages. 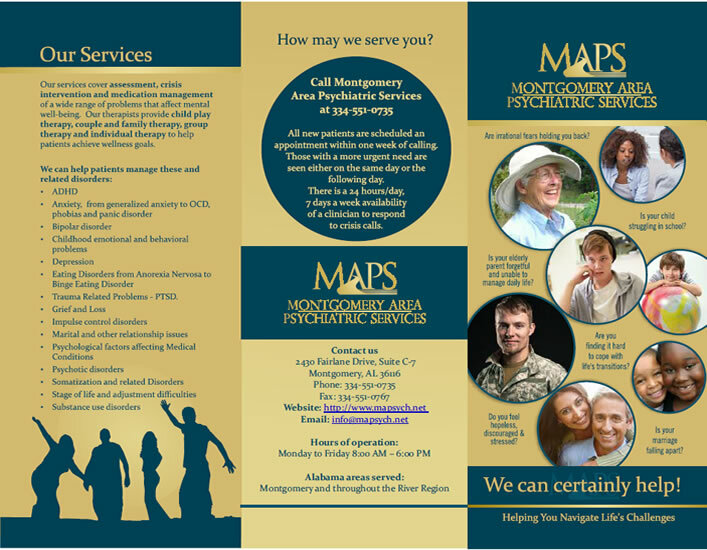 The content in the brochure highlights the advantages of MAPS, its Patient Centered Treatment Planning, quality psychiatric care, its convenient location, holistic treatment, services, and highly qualified staff. The Clinical Staff and their focus areas of interest and experience are given prominence.. A silhouetted image promises positive results and contact details are given on the back cover. The brochure is designed in the blue and gold of the MAPS logo. Entheos was given the task of creating a brochure for patients, given the information we had for the doctors’ brochure. We set about creating a new look and feel for this brochure while using the MAPS logo colors of blue and yellow. The cover uses circular design elements to draw attention to typical age groups and problems that MAPS deals with and manages. Circles also symbolize wholeness, giving a positive message. Images of people of different age groups are presented in circles, reflecting the concerns and conditions that MAPS typically deals with and manages - from anxiety and fear to marital relationship and parenting challenges, to PSTD and childhood emotional problems. into opening the brochure and reading its contents. The content emphasizes the advantages of MAPS, its Patient Centered Treatment Planning, quality psychiatric care, convenient location, holistic treatment , services and highly qualified staff. A silhouetted image promises positive results. Contact details are given on the back cover and an accent circle in blue puts the focus on the 24/7 availability of a clinician for crisis calls. The brochure is designed in the blue and gold of the MAPS logo. 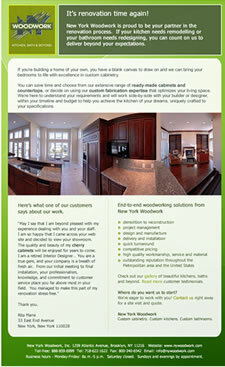 Our client asked us to design a brochure to appeal to customers who appreciate fine custom cabinetry. These are people who have high standards, demand excellence, with no compromise on quality of materials and expect turnarounds within project delivery schedules with no time and cost over-runs. People expect remodeling to be stressful, and are pleasantly surprised when it isn’t. 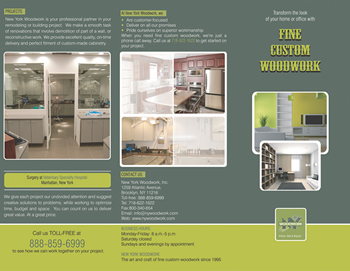 of work done by New YorkWoodwork, while the images highlight the final results - beautiful cabinetry. 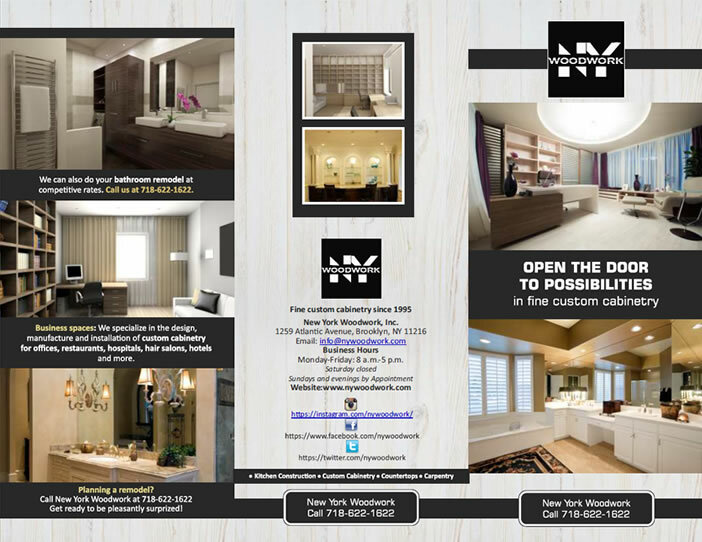 capability and helps to personalize the brochure. concentrates on contacts and social media links. 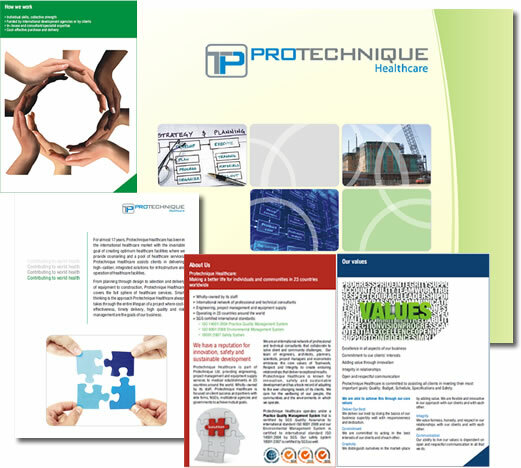 Protechnique Healthcare wanted a corporate brochure with copy on the lines of their existing website. Apart from attractive design, the job involved editing, re-writing and writing fresh copy on case studies, with information gathered through constant communication with the client. Protechnique Healthcare is part of Protechnique Ltd., which has a track record of successfully completing healthcare and engineering projects in 23 countries worldwide. Protechnique Healthcare is presented against the backdrop of the strengths and values of the parent company, along with appropriate visuals. Cover design uses a collage of pictures that display the core expertise of the company, against a green and light yellow background, symbolic of health. The overlapping green circles represent the world. Appropriate visuals (using jigsaw pieces as a theme in the first section) emphasize the company’s ability to collaborate, plan, engineer and ensure the successful delivery of a final finished project. Tagline – “Contributing to world health” was selected from various options presented to the client. Bullet points and headlines serve to draw attention to the main points in each section. Core expertise of the company is emphasized – Planning, Engineering, Project Management, Healthcare Equipment. Case studies with ‘Before’ and ‘After’ photographs or work in progress at different job sites, along with a client testimonial are used to demonstrate Protechnique Healthcare’s capabilities in managing healthcare projects for large international agencies like the UN. 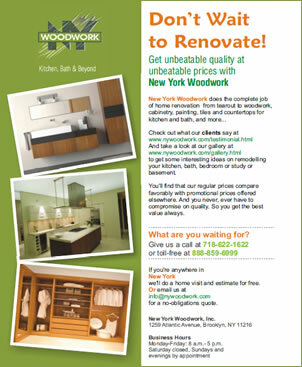 Pictures of New York Woodwork’s focus areas of “Kitchen, Bath and Beyond” are interspersed with brochure copy describing the company’s key business strengths and fourteen-year track record, the benefits the customer gains by working with New York Woodwork, project management skills and contact information. 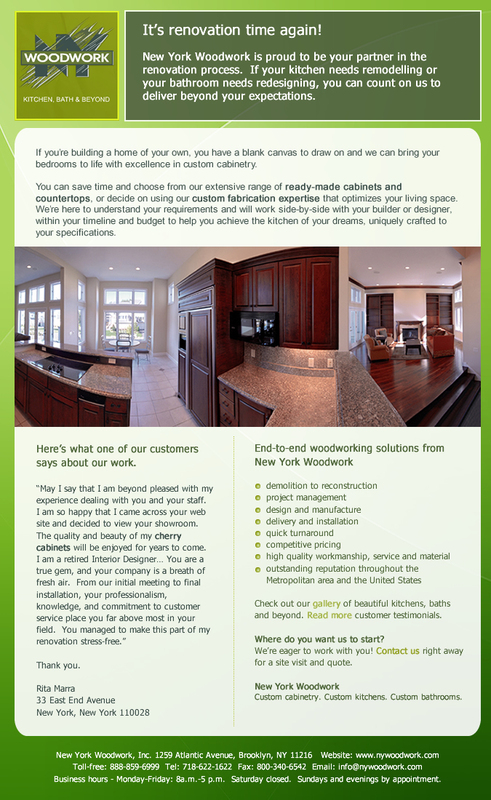 Our client came back to us for a Flyer and Emailer which used client testimonials to promote their home renovation and redesigning services. Our client received good feedback on the EQS website customized by Entheos, and engaged Entheos to design and write a custom brochure and presentation folder. 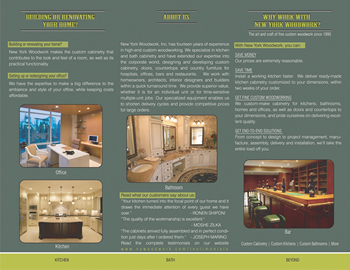 The brochure copy closely followed the text of the EQS website but required tighter editing for a trifold brochure (A-4 size after folding). 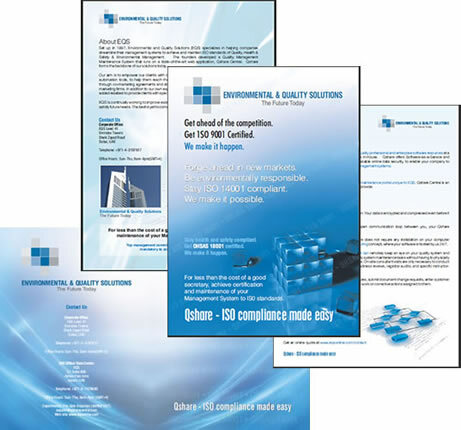 The cover copy and design draws in the target audience with the benefits of ISO certification at affordable costs, while focusing on ISO 9001, ISO 14001 and OHSAS 18001 with tiled watermark text. The brochure copy supported with visuals answers the questions topmost in a customer’s mind – “What is the Q-share Small Business Scheme?” “What do I get for what I pay?” “How does Q-share work?” The advantages of Consulting Services and Data Backup services are also presented.